What do these things have in common? Extension cords, advertisements, your spouse’s failures or bad habits, social media, great evil, horrific tragedies, sickness or pain, and your children or your parents. They all can easily trip us up or entangle us. How many times have you either tripped over an extension cord or, while pulling one, had it snag on something? Ever been caught by an advertisement or an item in a store window and made an impulsive purchase? Or the day was going fine, and then your spouse said or did something that ticked you off, and for the next hour, day, week, year, or even longer, it so occupied your mind that it ruined your life? Am I the only one who has been distracted from an important task with an urge to check Facebook or my texts to see if I was missing something important? Many people are tripped up in their faith in God because of the very presence of evil in the world, or by the tragic loss of life. Sickness and pain nag at our minds and bodies to the point of exhaustion. Have you noticed how your mind can become consumed with the problems your children or parents have? All of these things and a jillion more give occasion for the sin of unbelief. Unbelief, of course, is the very opposite of faith. Since faith works through love,1 and whatever is not of faith is sin,2 we should watch out for unbelief. There are many warnings against the sin of unbelief in Scripture. Let me cite several. The unbelieving cannot see the light of the gospel: “In whose case the god of this world has blinded the minds of the unbelieving so that they might not see the light of the gospel of the glory of Christ, who is the image of God” (2 Cor. 4:4). Continuing in a state of unbelief warrants God’s severest punishment: “But for the cowardly and unbelieving and abominable and murderers and immoral persons and sorcerers and idolaters and all liars, their part will be in the lake that burns with fire and brimstone, which is the second death” (Rev. 21:8). Even professing Christians must watch out for unbelief: “Take care, brethren, that there not be in any one of you an evil, unbelieving heart that falls away from the living God” (Heb. 3:12). Unbelief easily entangles us, so it must be laid aside: “Therefore, since we have so great a cloud of witnesses surrounding us, let us also lay aside every encumbrance and the sin which so easily entangles us, and let us run with endurance the race that is set before us,” (Heb. 12:1). Jesus often reproached His disciples for their unbelief: “Afterward He appeared to the eleven themselves as they were reclining at the table; and He reproached them for their unbelief and hardness of heart, because they had not believed those who had seen Him after He had risen” (Mark 16:14). Unbelief corrupts the mind and conscience: “To the pure, all things are pure; but to those who are defiled and unbelieving, nothing is pure, but both their mind and their conscience are defiled” (Titus 1:15). These verses should cause us to pause and ask ourselves: How can we recognize unbelief and avoid it? How does unbelief affect our ability to love? Have we been tripped up by unbelief? You are probably familiar with the adage called Murphy’s Law. It is typically simply stated, “If anything can go wrong, it will.” That’s been my observation, for instance, about extension cords. If there is something that a cord can get entangled with, it will. I reeled in my 100 ft. extension cord to my electric blower. There was a stick in the driveway—only one stick—one opportunity for my cord to be snagged, and you guessed it, that stick got entangled in the cord. In the same way, all it takes is for one thing to go wrong in our lives, and unbelief will snag it and put it before our minds as a reason not to trust God. When such things happen, we may justify ourselves if we feel angry, vengeful, or have some other expression of unbelief. In a way, unbelief has qualities like OCD (Obsessive/Compulsive Disorder). Unbelief fixes the mind on something wrong or unpleasant, and you can’t seem to shake it. Perhaps you have experienced a “mind worm”: when a song gets stuck in your head and you can’t seem to get rid of it. Unbelief, in a similar fashion, latches onto some worry, problem, or offense and distracts you from God’s love and sovereign administration of your life. It seems as if you can’t get that problem out of your mind. Before long, you’re blaming yourself or others for your troubles, and God’s love and presence seem distant. Have you ever been there? My point is that unbelief is opportunistic. It takes opportunity with whatever is visible and keeps your mind focused on it. Unbelief focuses on what we see and experience in life, whereas faith focuses on Jesus, sitting enthroned at the right hand of God, with all authority over everything in heaven and on earth. I hope this contrast between unbelief and faith will be as helpful to you as it has been to me. The writer of Hebrews certainly grasped this important, practical truth. He wrote, “Now faith is the assurance of things hoped for, the conviction of things not seen.3 Therefore, since we have so great a cloud of witnesses surrounding us, let us also lay aside every encumbrance and the sin which so easily entangles us, and let us run with endurance the race that is set before us, fixing our eyes on Jesus, the author and perfecter of faith, who for the joy set before Him endured the cross, despising the shame, and has sat down at the right hand of the throne of God.”4] If faith fixes the mind on Jesus and His sovereign administration of all things, then unbelief fixes the mind on the things that are on the earth, things which seem painful or out of our control. Everyone was focused on the terrible tormenting condition of the man’s son. It looked hopeless. The suffering of the son and the father fueled unbelief in everyone. His condition screamed to everyone but Jesus, “God is not here, and nothing or no one can help us!” The honesty and vulnerability of the father impresses me. He believed to some degree, or he wouldn’t have brought his son to Jesus. However, he needed help because of unbelief. The problem appeared too difficult, and hopeless. So Jesus helped the father’s unbelief by healing his son and showing him that He is, indeed, Immanuel—God with us. Let me contrast two very different responses to a couple of opportunities we have almost daily. Every circumstance is either an opportunity for unbelief to entangle us and trip us up, or it’s an opportunity to trust God. Every relationship is either an opportunity for unbelief to entangle us and cause us to despise God and idolize the person, or it’s an opportunity to trust God and love the person with His love for His glory. Whether you are going through the darkest, deepest waters or through a little bump in the road, unbelief always waits to snag you and trip you up. The sooner you recognize that you are in a battle against unbelief, the sooner you will experience freedom and even joy in the storm, which puts you in a position to love more deeply. 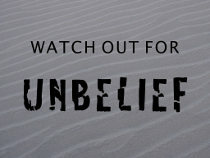 How do you recognize unbelief? Unbelief focuses on what you can see and experience. The events and people we see in our paths each day have been put there by God4 for His purpose, and if our minds get entangled with the circumstances and the people, we will certainly respond wrongly. Sometimes, God’s purpose for the storms He orchestrates is to do just that—to let us see that we have unbelief in our hearts that needs to be exposed and repented of. God’s children know that we are being sanctified and conformed to the image of His Son. For us to become like Christ, everything that is not like Christ must be revealed. Our unbelieving thought patterns must be brought out into the open. God, in His love for us, allows the opportunity that brings out the unbelief through some circumstance or relationship. Following the unbelief comes a spirit of idolatry that looks to the thing or person as the source of our happiness or security. We will discuss that more in anotherChariot of Fire. For now, we need to realize that God uses all circumstances and relationships for good—to conform us to the image of Christ. When we can see the unbelief and repent of it by fixing our eyes on Jesus as the author of our faith and the Lord of all things, we plug ourselves into the power source that generates love. Love can only flow through us when faith is working. Faith looks at what can’t be seen with our physical eyes—Jesus enthroned and all things subjected to Him in this world and in our lives. When we look to Him as the source of all things and trust Him with all the affairs of our lives, we defeat unbelief and give faith an opportunity to grow and work through love. Have you been tripped up by unbelief? “For in Christ Jesus neither circumcision nor uncircumcision means anything, but faith working through love” (Gal. 5:6). “. . . and whatever is not from faith is sin” (Rom. 14:23b). “Now faith is the assurance of things hoped for, the conviction of things not seen” (Heb. 11:1). “Therefore, since we have so great a cloud of witnesses surrounding us, let us also lay aside every encumbrance and the sin which so easily entangles us, and let us run with endurance the race that is set before us, fixing our eyes on Jesus, the author and perfecter of faith, who for the joy set before Him endured the cross, despising the shame, and has sat down at the right hand of the throne of God” (Heb. 12:1-2). “And He answered them and said, ‘O unbelieving generation, how long shall I be with you? How long shall I put up with you? Bring him to Me!’” (Mark 9:19). “And Jesus said to him, ‘If You can? All things are possible to him who believes.’ Immediately the boy’s father cried out and said, ‘I do believe; help my unbelief.’” (Mark 9:23-24).